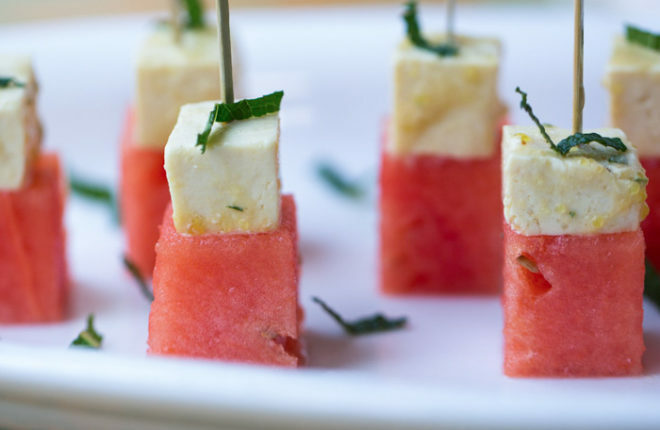 Sweet watermelon paired with salty tofu “feta” – the perfect combo! Super easy and simple; I love this summertime appetizer. One of the many fun (yet challenging) things about having a kid is the fact that they don’t, you know, just inherently know the same things you do. I mean, I’m stating the obvious here, but sometimes this fact still comes as a surprise to me. Like the other day, when Joan Jett’s “I Love Rock & Roll” came on the car radio, and I suddenly called out “yowwwwww!” because that’s what you do when I Love Rock & Roll is on the radio. My kid was startled. “MOM! What happened?! Are you okay?! !” “What? Oh, I’m fine! Just singing a song.” Sigh of (confused) relief on my kid’s part; cue Joan Jett lesson on mine. There are worse teaching moments, I suppose. A few days later, when we were picking out a watermelon for this recipe, I was more prepared for the lesson. I told my daughter all about how you look for a big yellow spot. Lots of scars are good. Give it a good knock and if it sounds a bit hollow, you’re good to go. But then I realized … every single time, I’m the only one in the produce section rapping on watermelons. Knocking watermelons is something my mom taught me; was she wrong? Was she messing with me? Have I been making a fool of myself all this time?! So much power, parenthood. So much power. 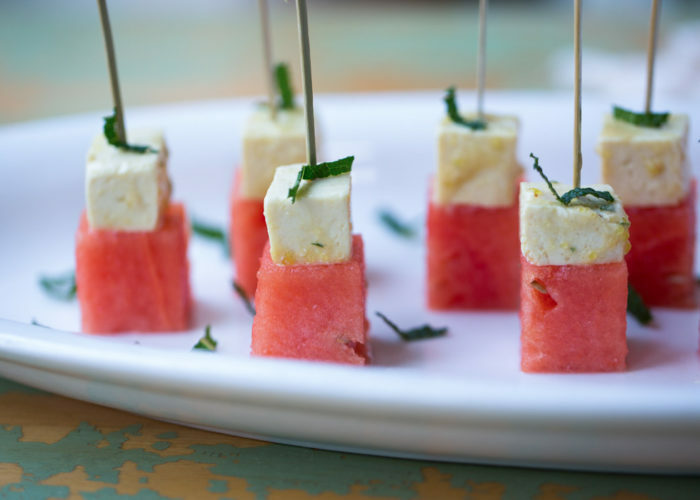 So, about this recipe for Watermelon & Marinated Tofu “Feta” Skewers. This was yet another appetizer I made for my plant-based canapé party (yep, I’m sharing them all!). I really wanted to share a tasty tofu recipe with my friends at the party, most of whom are actually meat-eaters. I don’t push vegetarian eating on my friends, but I do take satisfaction when I can give them a plant-based food that they previously thought weird or gross and perhaps convince them that’s it not so bad or, even, quite delicious. 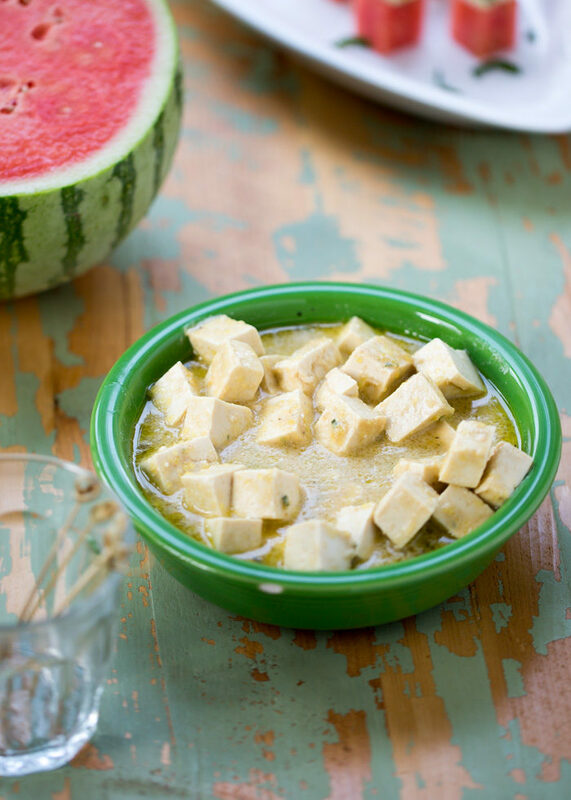 For the tofu “feta,” you use extra-firm tofu, squeeze all of the water out of it, then let it rest it in a highly-flavored marinade so all that flavor soaks back into it. 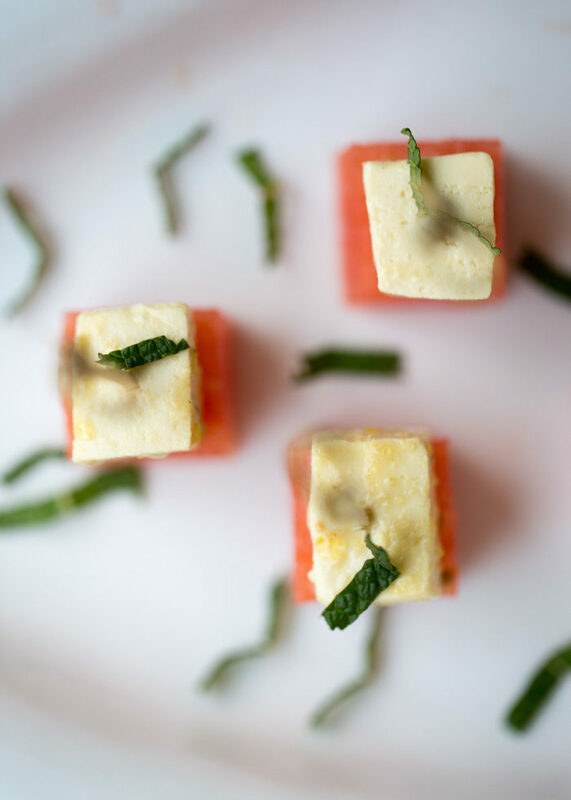 The result is a pretty feta-like cube of tofu. It’s not the exact texture or flavor of feta, but to be honest, I actually find this tofu far more delicious than actual feta. I used this recipe from Green Evi as a starting point. While usually I shy away from “weirder” ingredients, I wanted to go all the way for my party, so I dove headlong into using nutritional yeast and miso in the marinade. Which, really, aren’t that strange as far as ingredients go, but they’re a little off the beaten path for me. I love the result. I could seriously just nibble on the tofu feta straight out of the jar. 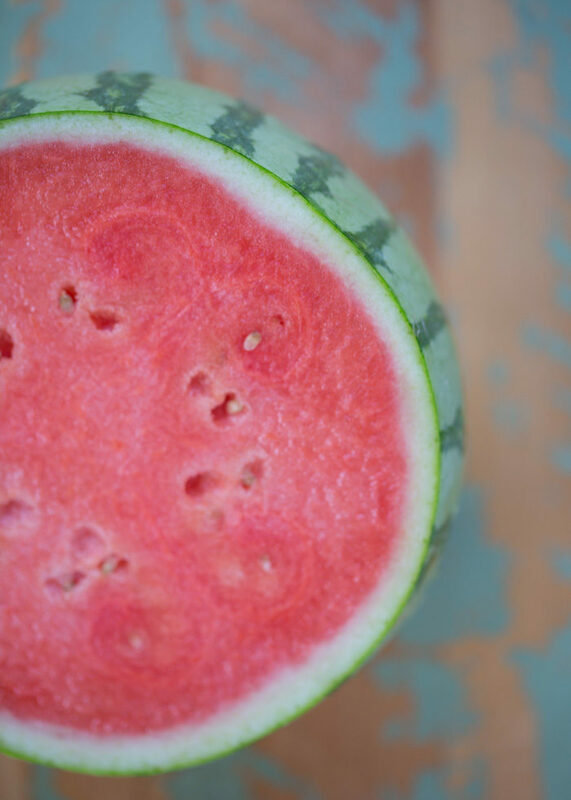 But it’s also perfect joined up with some cool, sweet watermelon. Sweet and salty, my friends, that’s the name of the game. 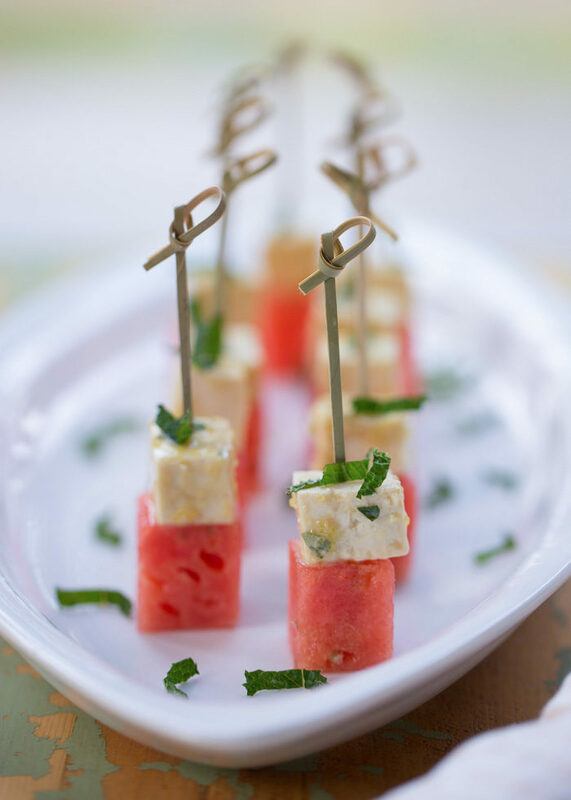 These Watermelon & Marinated Tofu “Feta” Skewers are seriously the simplest, easiest little appetizer around. Just get the tofu feta going, let it sit for awhile in the fridge, then take 10 minutes – if that – to assemble. It’s also fun to add a few little bits of mint for color and a bit of extra flavor, though entirely optional. To press the water out of the tofu, place the tofu between two kitchen towels or several layers of paper towels. Set on a plate and place something heavy on top – three or four books, or, if you’re in kitchen reno mode like me, a couple of granite countertop samples (they work perfectly!). Let sit for 30 minutes to an hour. Cut tofu into approximately 3/4-inch cubes. Pile the cubes in a 24-ounce mason jar or another container that has an airtight lid. Make the marinade. To a medium bowl, add the vinegar, lemon juice, miso, olive oil, nutritional yeast, oregano, salt, pepper, and 1/3 cup water. Whisk well until thoroughly combined. Pour the marinade over the tofu. If there’s still a bit of room in the jar, add the rest of the water. 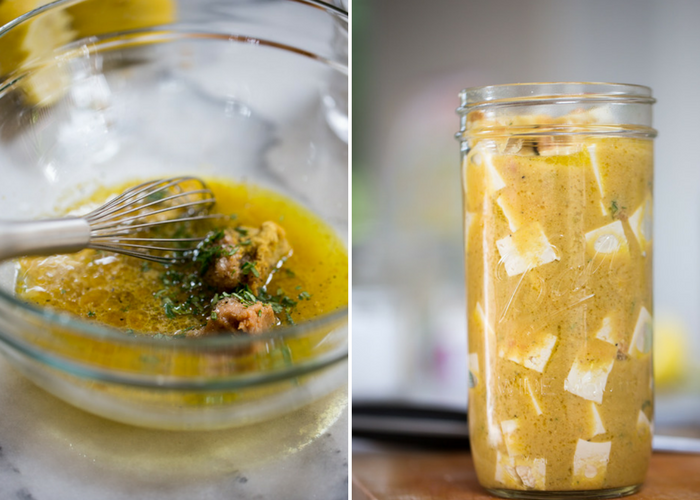 Seal jar and give it a gentle shake to make sure the marinade has covered all of the tofu. Refrigerate for 4 hours, up to 3 days. 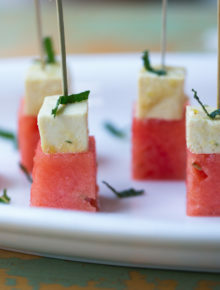 To make the skewers, press a cube of tofu feta and then watermelon onto a skewer. Set on a platter and garnish with bits of fresh mint, if desired. Recipe time allows for 4 hours for marinating the tofu feta. Tofu feta recipe adapted from Green Evi. Greetings from Nepal! Loved the recipe, It’s something I have never tried before but now I feel necessity to try this! Hi! You can certainly just leave out the oregano. Otherwise, a tiny bit of thyme or some dried mint might be nice.